French tennis coach and TV commentator Patrick Mouratoglou hosts his own daily TV show for Eurosport, commentates on ESPN, is founder & President of the Mouratoglou Tennis Academy & Resort, philanthropist and the most followed coach in the ‘tennisphere’. Patrick started coaching Serena Williams after she had suffered her first ever opening round defeat in the main draw of a Grand Slam tournament. Since then, Patrick has guided Williams to her fifth, sixth and seventh Wimbledon titles, the Olympic Gold Medal, her fourth, fifth, and sixth US Open titles, her second and third French Open titles, three consecutive year-end championships titles, her sixth and seventh Australian Open title and lifted her back to World No. 1 in the WTA rankings. This is his story, proving how vital the talents of a great coach are in harnessing the talents of the player. A must read for tennis devotees and a great insight into the everyday goings on that help to prepare the world’s top players for success. 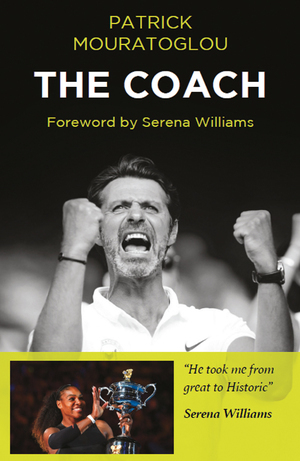 Now one of the world’s leading coaches who is responsible for transforming the career of Serena Williams and helping her become the world number one, his story is a great example of trial over adversity. Photos: 8 page plate section.